Oh, FitzChivalry Farseer and my Beloved Fool, how do I love thee, let me count the ways. Apparently at least eleven books’ worth. Wait, don’t run away! This is my favorite fantasy series — and one of my favorite series, period — of all time. Of all time. Yes, it’s hefty, but don’t worry, I’ll help you through it. And if you love richly built fantasy worlds, complex characters, strong friendships, magic, and dragons, I promise you, it’s worth the time commitment. First, some basic orientation. Robin Hobb’s FOOL’S QUEST is clearly not a standalone, but the second installment in a new trilogy (beginning with FOOL’S ASSASSIN) that follows two other trilogies, starting with ASSASSIN’S APPRENTICE, where we meet main protagonist Fitz as a young child, and ending with FOOL’S FATE, where we leave him as a grown man. Plus there are two other companion series set in the same world — the brilliant Liveship Traders trilogy (starting with SHIP OF MAGIC), and then the Rain Wilds Chronicles (which I have to admit I haven’t finished yet — I’m working on it!). The companion series are not necessary to read and understand the Fitz books, but they very much enhance the experience. 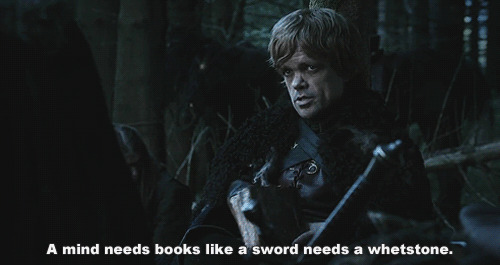 That’s fifteen books thus far set in this world. And counting. The Assassin trilogy: ASSASSIN’S APPRENTICE, ROYAL ASSASSIN, ASSASSIN’S QUEST. The Tawny Man trilogy: FOOL’S ERRAND, GOLDEN FOOL, FOOL’S FATE. And then the first book in the new Fitz and the Fool trilogy: FOOL’S ASSASSIN. These books all share a protagonist — FitzChivalry Farseer — and proceed chronologically throughout his life, each book building off the events of the last. There’s really no skipping around if you want to read about Fitz — sorry — but at the same time, I cannot overemphasize how much I enjoy reading about Fitz. Like many high fantasy series-starters, the first book in each series takes a little while to really get going, but once it does, hoo boy. Try as I might, there’s really no way for me to review the fifteenth book in an ongoing series without spoilers for the preceding books, so if you haven’t read them, proceed with caution. I’ll try my best not to be too spoilery, but even the broad strokes give away some major developments of the other books in the series. So. Continue at your own risk. With all that out of the way, let’s get to my thoughts on Fitz’s latest adventures in FOOL’S QUEST (Fitz and the Fool #2). 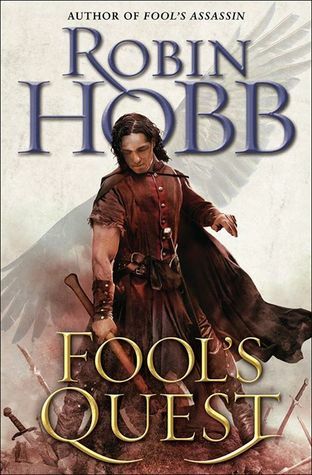 I can’t tell you how excited I was when I found out Robin Hobb was writing a new series about Fitz and the Fool. While we left both characters in a pretty satisfying place at the end of FOOL’S FATE, I’d come to love these characters like family. I missed not being able to journey alongside them on their adventures. So although I had no idea what to expect as far as a conflict for a new series — the main conflict in both the Assassin and Tawny Man series is pretty handily wrapped up at the end of FOOL’S FATE — I was eager to return to the world of the Six Duchies. Like the first books in most of Hobb’s preceding series, the initial installment in the Fitz and the Fool trilogy, FOOL’S ASSASSIN, takes its time ramping up. I very much enjoyed it — by this point in the series, my overwhelming fondness for FitzChivalry Farseer means that I’m totally cool following him through a series of quiet and mundane tasks, whether it’s managing his estate or dealing with his children (mostly because Fitz has gone through so many dark times that I’m beyond pleased that he has an estate, or children) — and this sort of slow grounding process is necessary to re-establish the reader in Fitz’s world and remind us of the events that led here — but as far as action goes, it’s not until the final act of FOOL’S ASSASSIN that we really see things take off. Not so with FOOL’S QUEST. Again, this is pretty well expected for each of Hobb’s series: Book 1 spends its time meticulously setting up an intricate pattern of dominoes, then Book 2 blazes in and knocks them all down, leaving the reader in a mess of perfectly executed chaos. FOOL’S QUEST was no exception to this. It hits the ground running, picking up right where FOOL’S ASSASSIN leaves off, and pushes the plot forward at a determined pace, never feeling rushed, but never letting up, either. High fantasy tends to run long in pages, but while reading FOOL’S QUEST, I found myself lamenting that there were *only* 500, 400, 300 pages left to go. You know that feeling when watching the extended edition of The Two Towers, and it ends and you simultaneously realize, “wow, that movie was three and a half hours long,” but also wish it didn’t have to end? That’s the feeling I had reading this book. 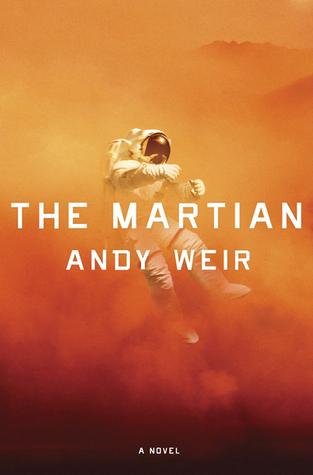 Though I was aware of its heft, when I turned the last page, I wasn’t anywhere near ready for it to be over. Unlike FOOL’S ASSASSIN, which focuses almost entirely on Fitz and his life far away from Buckkeep Castle, FOOL’S QUEST returns him to his old stomping grounds, where we finally get to catch up with beloved (and Beloved) characters of the past. The Fool is there, of course (I was surprised at how little The Fool was in the first book, given its name), just as mysterious and tragic as ever, along with Chade, Kettricken, Dutiful, Elliania, Nettle, and a host of minor characters whose inclusion made it feel like a true homecoming not just for Fitz, but for the reader. There are even some cameos from characters from the Liveships and Rain Wilds books, whom I hope we see more of as the story progresses. Although this series of series has always tied together beautifully, to me it’s always felt kind of like a quilt, with clearly distinct pieces coming together at the edges and making up a whole. The Fitz books overlapped with Liveships, which overlapped with Rain Wilds, but they were all still their own separate entities. But in FOOL’S QUEST, for the first time, it began to feel more like a tapestry, with the threads beginning to weave over and under and through one another. It’s possible this won’t come to fruition, and that this Fitz series, like the other (brilliant) books before it, will end up more or less self-contained. But I kind of doubt it, and look forward to seeing how Hobb continues to tie this massive world and cast together. As with every one of Hobb’s preceding books, in FOOL’S QUEST you can expect a host of fully realized, complicated characters, lush worldbuilding, achingly gorgeous prose, vivid emotion, catastrophic stakes, and thrilling action. But for me, the relationships between the characters are what shine the brightest. Fitz’s friendship with The Fool is, of course, the Catalyst on which the whole story pivots, and always has been. Watching these two characters who have been through so much together interact and trust and plead and betray and forgive is a truly beautiful, frustrating, heartbreaking, uplifting experience. Contrasting that is Fitz’s relationships with his daughters, where he is not a Catalyst, but simply a father, with all the expectation and disappointment and responsibility that brings. Watching Fitz try to navigate fatherhood, after watching him grow up and struggle and fail and triumph, is both rewarding and agonizing. I want nothing but the best for Fitz, but both fate and his own shortcomings are constantly getting in his way. I want to take him by the shoulders and shake him and hug him, maybe at the same time, which for my money is one of the hallmarks of a truly excellent protagonist. I could go on for ages, but suffice it to say, all of Fitz’s other relationships are similarly complex and well-drawn. Each feels like fully realized person, and the way Fitz interacts with each person he encounters is wholly authentic and honest, whether he’s fighting to the death or gently caring for a traumatized stable hand. Though the sweeping plot of FOOL’S QUEST is every bit as intriguing and suspenseful as Fitz’s quest to aid King Verity against the Red Ships Raiders, or traveling to Aslevjal island to slay a dragon, it’s these relationships and interactions that are the true meat of this series. 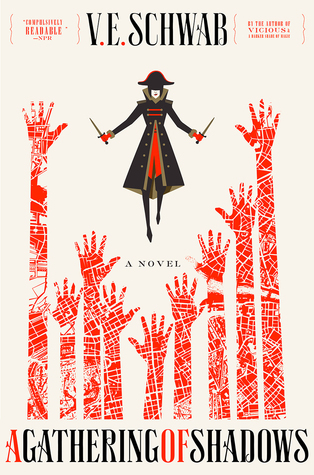 Ultimately, this isn’t a recommendation for this one book — if you’ve already read the preceding 7-14 books, you probably already have a pretty good idea if you want to read this one — but for this series, and every series about FitzChivalry Farseer. If you’re not sure if fantasy is your thing, or you’re hesitant about picking up the first book in a series that is so sprawling, let this be your assurance that this is a series that only gets better as it continues. It’s worth the time, it’s worth the investment. Fitz and The Fool are two of the greatest characters I’ve ever read, and as long as Robin Hobb sees fit to keep writing books about them, I’ll be the first in line to read them.